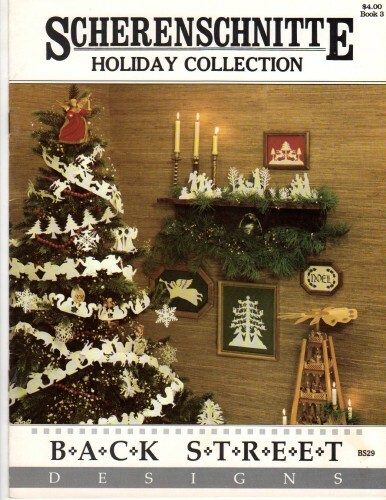 Back Street Designs Scherenschnitte Holiday Collection Book Three paper cutting pattern booklet. Dove, Angels, Rooster, Tree, Angel and Star, Angel and Babe, Snowflakes, Gabriel, Rabbit, Squirrel, Reindeer, Santa, Teddy, Pig, Nativity Scene, Noel, Tree, Easter Eggs, Easter Rabbits, Cornucopia, Turkey, Apple Tree, Fruit Wreath, I Love You Too, Sweets for the Sweet, Heart and Dove. Appears new.